All told, I’m doing fairly well on this restricted diet. I’ve come up with some incredibly, um, creative recipes. Some good, and some not so good. This one? This one is good. Of course, it’s almost not mine. It’s almost entirely Danielle’s from Against All Grain. She came up with an amazing looking sandwich bread. I modified it. It’s so much hers, that I’m going to make you go to her site to get the directions. I’m just going to give you the ingredients. One note – the sunflower seeds react with baking soda to turn green. The mesquite flour in this recipe “hides” most of the green. (You might still notice a slightly green tint.) There’s nothing wrong or bad with green. But, brown is so much more appetizing, don’t you think? What do you do with all those ingredients? Head on over to Against All Grain and find out. This might not seem indulgent to you at all. But, after the way I’ve been eating these last few weeks, a baked good of any sort is EXTREMELY indulgent. For other slightly indulgent treats, check out Slightly Indulgent Tuesdays. 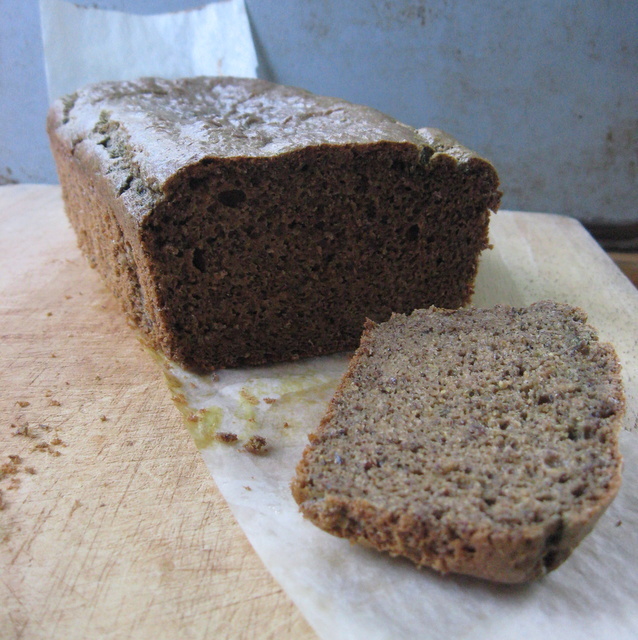 This entry was posted in bread, grain-free, nightshade-free, nut-free, sunflower seeds and tagged bread, nightshade-free, nut-free, paleo, recipes. Bookmark the permalink. That looks like such a great texture! wonderful recipe! Hi Deanna – thanks for sharing my recipe! Did you know that if you reduce the amount of baking soda and add a little lemon juice you can usually counter the green color? Although the mesquite powder does give it a nice rye look to it! I read that on you “peanut butter” cookies post. I haven’t tried it yet though. Thanks for the info! Sure. I was/am supporting a friend who is dealing with chronic pain issues. The doctor and naturopath are trying to determine if something is causing some underlying inflammation in her body. So, we’re following a diet that supposedly is fairly anti-inflammatory. I’m actually slowly adding things back in right now – testing one food every few days. So far, coconut is a go. Sesame seeds a no (I think – need to re-test.) Those are really the only things I’ve tried so far. Hi. I’m a little confused…you mention mesquite flour, but in the ingredients list is says mesquite honey. Is there mesquite flour in the recipe? If so, how much? Thanks!